I am a newcomer to your website, and I just love it. 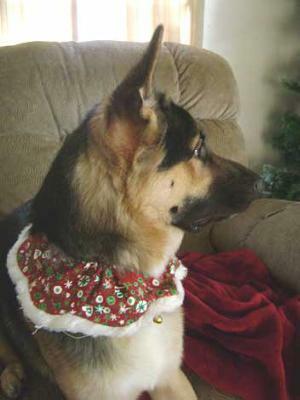 Very informative as this is my first German Shepherd. I have included a picture of Luke. He just turned the big ONE not too long ago. He is very vibrant, happy, loving and busy. We love having him in our home, and he is very attentive with the children. We look forward to many fun filled years with him. Thank you for your time, and we hope you enjoy our picture of Luke. Hello to you all too, Smith Family, and thank you so much for sharing your great story and picture all about your wonderful German Shepherd Dog Luke. It's always nice to hear about all our wonderful German Shepherd puppies out there. Luke is absolutely so handsome. What a stunningly gorgeous young man. You definitely have a great boy there and I'm sure he'll prove to be a great companion to all of you.